If you are about to launch a new app or service for mobile devices, doing that for Android is kind of a double-edged sword. On the one hand, you can access a vast community of users based on the sheer number of Android installations world-wide. On the other hand, this massive amount of users are not running a homogeneous Android base or devices. Vast differences in performance, screen size, installed Android version, and more, makes it extremely difficult for developers to fully exploit the potential of the platform. In addition, there is always a latent security risk of having devices running old and outdated versions of Android. A very prominent – and extremely severe – example has just happened with the Stagefright bug, allowing an attacker to get control of the Android device by simply sending a multimedia text message to the target. This vulnerability concerns millions of Android devices in the market, which haven’t received an appropriate security update. However, due to the nature of the Android update process – an update is developed by Google and given to the handset manufacturers and to the telecom providers, which have to roll the update out to the users – this security update either has not happened, or even is not going to happen at all. 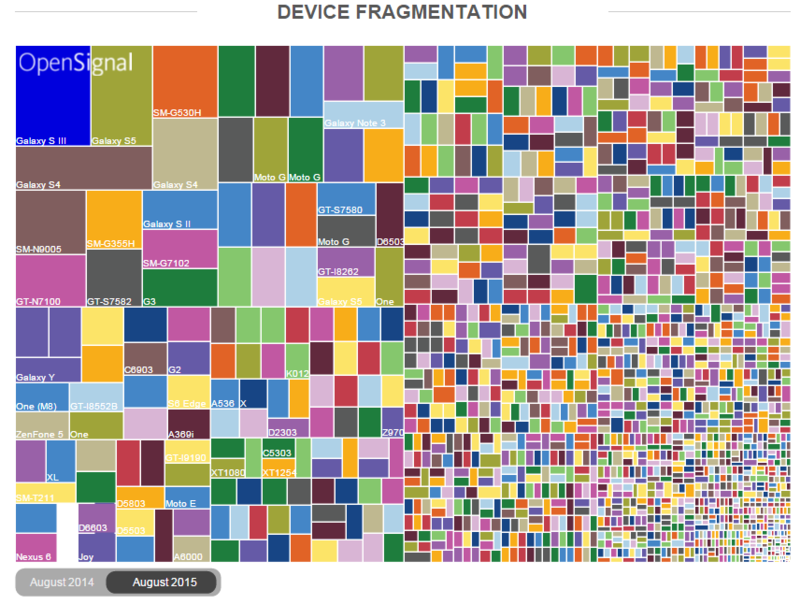 Analysts from opensignal have created an extremely interesting overview map of the current state of Android fragmentation by devices, OS version, and brands, based on data of 682,000 devices worldwide. The first chart below show the over 24,000 distinct device types of the study. The second chart show the differences between iOS and Android, and the fragmented state of OS versions developers for the platform have to consider – from both application/service and data security point of view.